Home > Other Blogs	> Does Pope Francis Believe the Shroud is Real? Does Pope Francis Believe the Shroud is Real? "RELICS The material remains of a saint or holy person after his death, as well as objects sanctified by contact with his body." ("Relics," New Catholic Encyclopedia, 2003)"
So by continuing to refuse to confirm or deny that the Shroud is authentic, and in fact calling the Shroud an `icon,’ Pope Francis, and the Vatican, is sending a mixed message that the Shroud could be a fake. 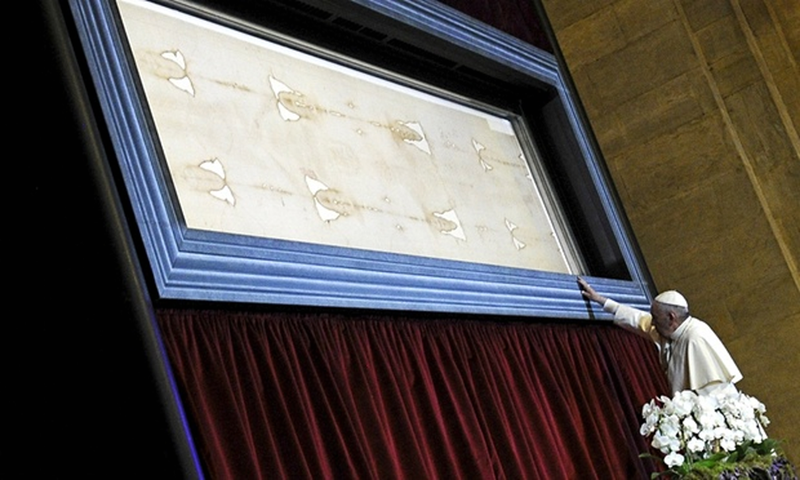 Pope Francis himself might well believe that the Shroud is a fake, but the Vatican, by its actions: 1) spending the equivalent of many millions of dollars protecting the Shroud; and 2) displaying it to many millions of people, clearly believes the Shroud is authentic. "The shroud draws [people] to the tormented face and body of Jesus and, at the same time, directs [people] toward the face of every suffering and unjustly persecuted person." This is damming the Shroud with faint praise and reinforces that Pope Francis really does think (wrongly) that the Shroud is just another fake icon. But the evidence is overwhelming that the Shroud is authentic, and therefore the image on the Shroud IS "the tormented face and body of Jesus"! Again, I am not being anti-Catholic in this but pro-truth and pro-Shroud (which is the same thing)! .. But I assume that the Vatican is trapped inside its policy not to confirm or deny that any of its relics are authentic, because then it would be under pressure to confirm or deny which of its many other relics are authentic, and the vast majority of them would be fakes. The quotation that begins, “The shroud draws,” is from an article, Pope Francis Pope Francis praises Turin shroud as an ‘icon of love’ that appeared in The Guardian June 22, this year. I believe that the statement has also been made by his predecessors that the question of authenticity is not a matter of faith but science. I believe, and I don’t want to start the debate all over, that science has demonstrated its authenticity. Some may disagree. That debate on this blog has been endless. But if you can accept the authenticity there is a deeper question: What is the meaning of its image and blood? The word “icon” has more than one meaning and does not necessarily in its mean a work of art. 4. someone or something regarded as embodying the essential characteristics of an era, group, etc. Christ is an icon of love. Each of those statements is fair and depending on your view, all may be true. And I’m always a bit suspicious of those who attribute beliefs to an institution. The Vatican believes this or that? Does it? Who exactly is the Vatican? The College of Cardinals? The Curia? The Archbishopric of Turin? Since I was there in May, Hugh, let me say that you really have no idea, in your “imagining”. I was there in May also. As was Hugh. His point about cost seems valid — certainly there would be costs for security, cleaning staff, and the venue preparation but many of the guides working there were volunteers I believe. Plus there were several vendors who no doubt paid good money to have exclusive rights to sell souvenirs and refreshments. The city of Torino will have also provided funding, given the return on investment for the city would be strong. And then there are the hotel kickbacks. The actual cost to the Vatican/Church would not likely be in the millions. Scripture says God made humans in the divine image (icon) and Paul writes that “Christ is the image (icon) of the invisible God…” (Colossians 1:15). Thus they are representations if the divine inage —in human form. No better accolade can there be than to call the Shroud an icon! This statement really could not be any clearer. Let me translate for the theologically confused: “the unique and supreme Jesus Christ comes to us.” (Jesus Christ = Word of God). But one could also say “By means of the Holy Scriptures, the unique and supreme Word of God comes to us.” And the Scriptures are human constructs (divinely inspired). The Shroud could be a human construct and still Francis’ statement would be true. Does Francis personally (as opposed to what he professes as pontiff) believe in the Shroud’s authenticity? It certainly looks that way. Does it matter, in the end, what he believes personally? No, it matters what you and I believe personally. Each person should come to their belief based on their own thinking and faith. It is not for anyone, pope or scientist, to tell me what to believe when it comes to the relic/icon’s spiritual significance. That is the worst logic I have seen and I cannot believe you wrote that in public. The “divinely-inspired Scriptures” are de facto not human constructs, because they were directed by the guiding hand of the Holy Spirit. If you don’t understand this, you have a limited understanding of Christianity. One does not have the unique and supreme Jesus Christ come to him from a human construct. I believe that the importance of the Shroud (if authentic) comes from the Blood, not the image. Was Christ’s blood sacrifice for the sins of the world just a spiritual act? Or was it both a spiritual and physical act? [Yes]. In other words, it was necessary that His blood had also to be physically spilled. Because His sacrifice extends from the Cross infinitely in both directions, Past and Future, the Blood on the Shroud has special significance. He is still with us, bodily — as he said in Matthew, and also from the evidence of the Ascension. Perhaps the Blood on the Shroud is a reminder of that. You need to brush up on your history of the making of the Bible. It was written by men, printed by men, on man-made materials. It was edited by men, errors in translation and words added by men. It was not handed to us by an angel like the Book of Mormon, not dictated to us by an angel as with the Koran. Is God talking to us through the Scriptures, through those who wrote it? Yes. But there is no miracle involved in the physical production of the Bible, only in its content’s inspiration. The same might be true for the Shroud – note I said might. It could have miraculous origins, in which case it would be a different revelation than the Bible. We’re not talking of the physically-produced Bible(s), and that is a red herring. But we do take our faith from the Gospels (and letters), and analogous to ink on parchment, the Shroud is a sort of Photograph on linen, and if authentic, represents a Fifth Gospel (IMHO). Again, the Blood is the Key. And if authentic (as I believe it to be), some people (like myself) can use it as a much better « tool » to meditate on Jesus’ revelation of a God who is love and nothing else than any other tool available like, for example, the crucifix. Among the recent Popes, only Benedict XVI demonstrated belief in authenticity openly, however that is his personal opinion, the relic is not part of the Deposit of Faith. That of course does not mean that the other pontiffs reject authenticity, they leave the matter to science. It was the Italian company Italgas which funded all that expensive equipment for the Shroud’s conservation. The Holy See gladly accepts donations. HP donated US$ 500,000 of computer equipment to them and an American millionaire, who preferred to remain anonymous, paid for the construction of a new building to house the cardinals during a conclave. If the Church thinks that the Shroud is a fake it would never have Italgas spending that amount of money. Shortly before the Exposition I commented on this blog that Pope Francis would talk about suffering, and that was exactly what he did. It was what could be expected of him. Being South American, he was influenced by the Peruvian priest-theologian Father Gustavo Gutierrez. He seems to have done the right thing. Shrould studies have fallen short of the mark, and carbon dating is not an easy matter for the Church because of anti-clericalism. The Popes could not say those things above and not believe in authenticity. As I said in the above comment, the pontiffs have not rejected authenticity, but they are also not in a position to make any official pronouncement as the matter has been left to science. Shrould studies have fallen short of the mark, and carbon dating is not an easy matter for the Church because of anti-clericalism. Concerning the C14 issue, I think the Church must look at herself in the mirror (and not at anti-clericalism) for not having suppervised this important scientific test correctly, thus creating the mess we are still in today. I also have doubts if Pope Francis considers the Shoud as authentic, nevertheless I think he is not so well informed on all pertinent scientific data on the Shroud. My guess is that he is seriously worried will all kind of human sufferings , social issues and even church scandals like corruption, lobbies and pedophilia so there is no time left for him to read anything credible about the Shroud. I have talked with priests who know almost nothing about the Shroud and to make things worse don’t show any interest to get any kind of knowledge. JUst for the record I know a priest who is also a historian-BUT HE KNOWS ALMOST NOTHING ABOUT THE SHROUD-who categorically denies the Shroud’s authenticity and even scoffs on the issue!!!! So this Pope’s attitude does not surprise me at all if he really has doubts on the Shroud’s authenticity. Nevertheless what is important is not the Pope’s opinion on authenticity but ALL CREDIBLE SCIENTIFIC AND HISTORIC DATA ( I i’m also including important conclusions from debates in this wonderful blog) pointing towards AUTHENTICITY. Concordo com você. O sofrimento humano preocupa o Papa, por isso falei antes da Exposição que ele ia falar sobre isso. Infelizmente, tanta bobagem está sendo falado tanto dentro com fora da área de estudos sobre o Sudário, que com certeza chegou aos ouvidos dele, que ele preferiu não falar nada sobre a autenticidade. Durante meus trabalhos escrevendo sobre a arqueologia bíblica e estudos bíblicos observei que nenhum estudioso o arqueólogo, padres incluidos, estavam interessados na relíquia. Não acredito que algo vai mudar na nossa geração. I agree with you. Human suffering worries the Pope, that is why I said before the Exposition that he would talk about this. Unfortunately, so much nonsense is being said both in and out of the realm of Shroud studies, which certainly reached his ears,that he preferred not to talk about authenticity. During my work writing on biblical archaeology and biblical studies I noticed that no scholar or archaeologist, priests included, were interested in the relic. I don’t believe that anything will change in our generation. The biggest nonsense that I see these days comes from all the religious propaganda done by DiLazzaro and his team of good catholics in Italy! Does this mean anything at all? Anybody? Good question, Hugh. I think the blog is meant for serious discussion, not for entertainment. I’ll repeat it again: to agree with DiLazzaro, Fanti or Jackson hypothesis about Shroud image formation, one MUST believe in the Resurrection of Jésus-Christ, since it is the only imaginary way we can think of a dead body that would emit the kind of high energetic radiation they propose! Not a single non-Christian on this planet (starting with most of the scientific community) will ever agree with these kind of religiously based proposals. If this is not religious propaganda, then I don’t know what it is. But I sure know that this is not good, honest, unbiased and non-agenda driven science. Yannick, the word is not propaganda. Views and beliefs will do fine. Why use a word that is insulting to people and implies intellectual dishonesty. Show some respect. ” 1. You need to be civil. No ad hominem, personal attacks, or character assassination, please! 2. Keep your comments brief. No lengthy diatribes. 3. Keep on topic. A little wandering is OK, but debates between two people who are getting way off topic are not helpful to others. It is what I found on a blog, one among many where serious discussions are going on. And you know Louis what really would be serious? It is to see Shroud researchers making a proper and unbiased check of all the known natural hypothèses out there, before even thinking of pushing in favor of any hypothesis relying on the Hollywoodish idea of a resurrection producing a burst of radiation… Now, that would really be something SERIOUS. Relics don’t fill empty stomachs. Is that mysterious Image a sort of idolatry? See also: the Knights Templar. to have some connection with the Templars. This can be another interesting point to discuss. a previous [and exact] order of their Divine Master)! in the second century ??? because the issue would seem to be quite intricate. professor of art history emeritus. The representations were done between 240 and 256 A.D.
“Holy Shroud of Jesus and Gandhara Buddha, etc.”? My previous intervention is a bit long. manner with the Holy Shroud. (be they Muslims or Jews, etc.)! sorry dan…but think hugh used “propaganda” first…not yannick…also…as long as you are talking about showing some respect, how about hughs comments about “good catholics”….you say “show some respect”…..isn’t that a bit of catholic bashing?…did I miss something? I believe you are referring, in confusion, to the post in which Hugh is quoting Yannick. Ooh, it’s like an Olympic epée bout, Rick; blink and you’ll miss who’s parrying who! In his passionate rejection of anything miraculous, Yannick described Paolo di Lazzaro’s laser experiments as Catholic propaganda. The mental gymnastics required to connect a centimetre of damaged fibres to a deliberate attempt to coerce unbelievers into the validity of Roman Catholicism are too obscure to be meaningful. The reason some people look to the Shroud is to find out if it confirms Scripture. The interpretation of Scripture can be a problem, particularly because it is the soul of theology. When it comes to systematic theology the problem becomes worse. God does seem to turn down the blinds when he wants to, leaving us to decide about faith. It can also be a real problem if people don’t understand by whom (mostly written by Jews) and in which context (mostly written by Jews with their religious and cultural Jewish background) these ancient texts have been written. It can also be a real problem if people don’t understand the main purpose these authors had, which was not to do the kind of historical account we are use to in the modern time, but mainly to enlight or strengten faith. I consider that Shroud of Turin is the First and primary Gospel and other gospels and also other books in New Testament are secondary. These days the “Top most Topic” in Australia is the Gay Marriage. Shroud image tell us that Jesus is the true Son of God and who came to this world tell us about the “Golden Rule”. – Don’t discriminate anyone on this world on any reason as all are the children of God and God love them all equally. The history of human knowledge and understanding demonstrates that we advance by faltering steps towards the truth, and only seldom by great leaps. It is true of the Amazon hunter, the college undergraduate, the doctoral specialist, and for the great many of humankind. It is true for each one of us as we make our own journey through life, from infancy, through childhood, the time when we are know-all teenagers, through to adult life and into our senior years. At first we are served milk and only later can we manage meat and potatoes. It is certainly true in matters of religion. It was true for the ancient Israelites journeying through the desert, for the primal Christian community, and through the subsequent years of history, but often with diversions into error or unjustified dogmatism. We are all at different places in our journey towards God. Those working in the mission fields understand this, and they know that God’s truth must be presented in a way that their target culture can understand and accept the realities which are only dimly perceived, otherwise they are wasting their time even trying. For many, specific relics, tokens and cultural practices are their way of coming to know God, and of worshiping the One who is ineffable. The “Vatican” does not need to give its imprimatur to this relic or that. It is generally sufficient for an alleged relic to have a reasonable record of provenance. Certain icons have been hallowed by centuries, or even millenia, of veneration by a countless number of faithful worshippers. Others more recent can uplift by presenting a fresh insight. Doubtless some alleged Passion relics may be of dubious authenticity. Their value is in what is called to mind by their particular form rather than by their substance. For those relics that are truly genuine, they must be considered especially sanctified by their contact with the truly holy. We are not angels of pure spirit but are of flesh and blood, and have a need to understand things in terms of a material reality, in order to reach a higher truth. the study of the inherent miracles? continuously for many years now. “Cult and Theft of Relics in the Middle Ages” ? Miracles and wonders are not the essence of religion, they are merely signs of a spiritual force. The essence of religion is to deny ourselves for the sake of others. How can I say I love God who I cannot see, if I do not show my love for a neighbour who I can see?! Thank you for your wisdom Daveb. Spirit is willing but Flesh is weak. The Lord Himself still authenticates His burial cloth. Truth (or even a ridiculous probability of what’s true) is certainly not dependent on anyone’s opinion. The Pope agrees I might assume. He may also agree that it is beginning to finally having its full intended effect, thanks to people like Joe Marino and John Jackson and so many other amazing shroudies around the Earth. “This Gospel of the Kingdom must be preached to all kingdoms.” Imperative. Go!! It’s clear to me The Vatican is using the word “icon” to be politically correct, given the fact science hasn’t publicly cleared the carbon dating findings. To claim it a relic would be too controversial. HOWEVER… with the church going to great lengths to preserve and protect the TS with security, controlled casing, etc speaks volumes regarding their opinion. As for the pope, his statements and prayers at the TS and regarding the TS demonstrates his individual opinion in its authenticity.